The following fill in the blanks come from an indie-rock band called Hipster Slayer. 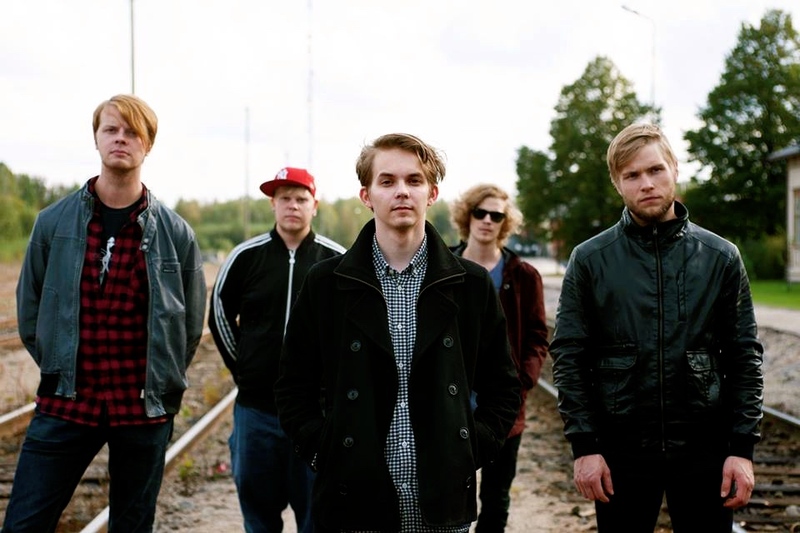 This experimental 5-piece is located in Jakobstad, Finland. The band formed in 2012 and released their single, “Skywalking,” in 2013. They became known for spreading their live performance videos all over social media. This past summer, they worked at Campus Allegro to record and release parts of their debut EP. After reading the band’s responses, be sure to check out their latest live performance video of “In Space” and stream the EP on Soundcloud. The meaning/story behind the name Hipster Slayer is…. We met each other….Mats, Toni, Victor and Tim studied music together back in 2012. We had a course at school where we were supposed to put together a project of some kind and do something creative with it. Mats, Toni and Victor decided that we’re going to make a “Robot-rock” project, and Tim’s going to sing and play keyboards. He did his compulsory military service then, so he didn’t know about it. A few weeks later when Tim had finished his military service we had our first rehearsal and it clicked instantly. Every following rehearsal Tim showed up with some lyrics and simple chord progressions that we worked on until we had a bunch of cool sounding songs. The “robot-rock” idea didn’t stick. From the start we seemed to find an own sound as a band. Fast forward a couple of months and we started to play gigs. For the first year and a half we brought in a different side-man on keyboards/backing vocals to fill out the music when needed. They were all great, but it took more time rehearsing for gigs since the side-men didn’t know our songs from the start. We all knew Joel from before, and we decided to make him an official band member when we noticed how well equipped he was. And he had nice hair too. The pickiest eater in the band is…. Mats: My instinct tells me it’s Tim. Mats: Every time I see a piano I have to sing a note and check if it’s correct. Guess that’s a kind of OCD. And Toni’s OCD is mind-f****** random people. Joel: Every time I get home I have to wash my hands in gasoline while reciting the collected works of Tove Jansson. Mats: Dress up as pro-wrestlers and have a plot that we follow until we’ve forgotten it’s a plot and everybody’s fully consumed in his character fighting for his life. Victor: Watch films and series, exercise, play football. Toni: Listen to music and play video-games. Mats: Flying Lotus – You’re Dead. Victor: Currently I am listening to King Crimson, Van Der Graaf Generator, Rammstein, Judas Priest and J-Soul Brothers. There is almost no limit for what I listen to. I also like to rest my ears and don´t listen to anything. When spending a lot of hours a day making music, it is good to have some silence in between. Mats: I remember how the song sounded, but I have no idea what the name of it was. But “Young” from our EP was one of our earlier songs. The member(s) who writes most of our songs is…. Tim. But the reality is, God. God writes our music. Really. Something we learned from creating the EP this year was…. Mats: Recording drums and bass at the same time instead of separately is probably a more effective method for us since Toni and me have been playing together in so many other projects besides Hipster Slayer. Toni: That you have to play like a machine. Something we want you to remember while listening to our music is…. Mats: The bass often sounds like it’s played with a knife. Tim: It’s not really blood, it’s only ketchup. If we play another band’s music it’s…. Our craziest or most memorable gig was…. Mats: A huuuuge bowl of Ben and Jerry’s Chocolate Fudge Brownie Ice Cream. Eaten to the point where I hate myself so much that I’m ready to die. Victor: Fitto, a traditional Finnish west coast meal with Italian spices. Tim: Pizzas, yes multiple pizzas. In the next six months you should expect….Us! This entry was posted in Fill In The Blank, Interviews, Uncategorized and tagged band interview, feature, featured artist, fill in the blanks, finland, finland music, Hipster Slayer, hipster slayer band, hipster slayer music, in space, Indie, indie rock, interview, music interview, recommended artist, rock, skywalking. Bookmark the permalink.